The actress, who came out in 2014, confronted the Republican presidential candidate about LGBT rights. 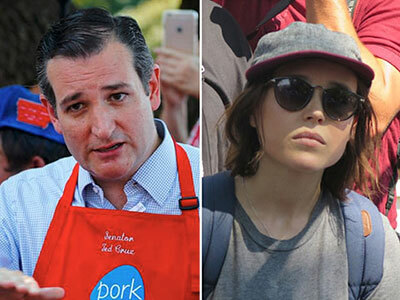 While grilling burgers at the Iowa State Fair, antigay Republican senator and presidential candidate Ted Cruz suddenly found himself being grilled by out actress Ellen Page, according to ABC News. The 28-year-old Oscar nominee crashed Cruz's photo op saying, "I have a question about LGBT people being fired for being gay or trans." Cruz, who has a long history of championing antigay businesses and legislation, failed to answer her question, replying, "Well, what we're seeing right now, we're seeing Bible-believing Christians being persecuted for living according to their faith." Not content to stop there, Page then asked him if he would "use that argument in segregation," at which point Cruz tried to shut her down by saying, "I'm happy to answer your question, but not to have a back-and-forth debate." But Page continued to press him. Cruz then pulled a classic "Be grateful it isn't as bad as it could be" move by citing the antigay oppression of extremist regimes such as ISIS and Iran. Page reminded him that Christians also use violence against LGBT people, citing her recent trip to Jamaica for Pride. The two ended up speaking for five minutes, and neither of them looked very impressed with the other's arguments. Take a look at the video and follow Ellen Page's Twitter account to see more jabs at Ted Cruz.